Video Streaming is Now Available!!! We understand there are times that work or life commitments get in the way of you attending the Monthly IIBA Chapter meetings. As a Chapter, our mission is to be able to provide educational opportunities to our members each and every month. Even though we would love to see you each month, we have heard your requests for video streaming. We are glad to announce that we now have the capability to offer video streaming for our Monthly IIBA Chapter Meetings!! If you would like to utilize this opportunity you will need to use the below Promo Codes when registering. After entering the Promo Code the cost will then display in the Fee section. Fees will only be collected via a credit card payment. 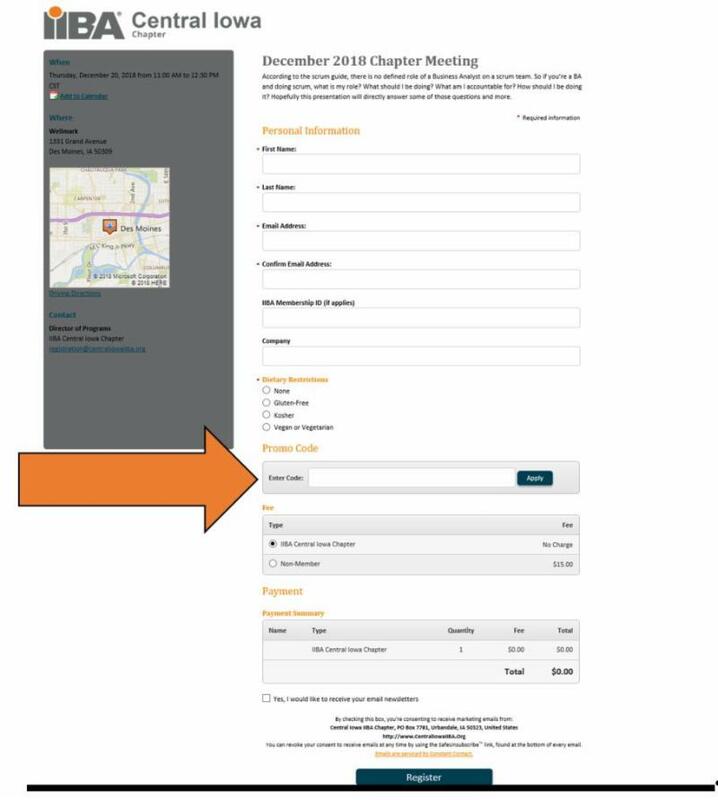 How this will work....on the day of the Chapter meeting, if you have opted and paid for video streaming, a URL will be sent to the email associated with the registration. You will then need to click on the URL after 11:00 am and you will be connected to the Chapter Meeting where you will have the ability to ask questions and participate.. If you have any questions or concerns, please feel free to contact the Communications Director at communications@centraliowaiiba.org.